Nuit de Cellophane was released by Serge Lutens in early 2009 as part of the brand's export collection. The press release for this fragrance includes a typically Lutensian snippet of prose-poetry and dialogue, but the sample-vial card offers a more concise description: "The night embodied in scent and sight. Chinese osmanthus." 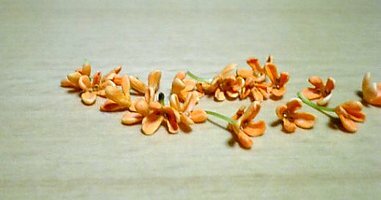 Nuit de Cellophane's list of notes includes jasmine, osmanthus, carnation, lily, almond, honey, sandalwood, and musk. I hope my "perfumista" credentials won't be revoked when I reveal that I'm not a Serge Lutens fanatic. I admire the line's artistic philosophy and many of its fragrances (and I did own the original Shiseido Féminité du Bois years ago), but although I can appreciate the scents in an abstract sense, I somehow don't enjoy wearing most of them. Even Sa Majesté la Rose, the rose soliflore of the line, which would seem to be a good fit for my tastes, rubs me the wrong way. (Is it the geranium that bothers my nose? the honey? I've never been able to figure it out.) Long story short, I respect Serge Lutens from a distance, but the house's aesthetic just doesn't fit me. On the other hand, Nuit de Cellophane sounded like the type of sweet floral that usually appeals to me, and if it turned out to be a non-Serge-like scent, as many diehard Lutensians lamented, then I would probably like it. Nuit de Cellophane starts with a rich bouquet of osmanthus and just a hint of cinnamon-like spice. The osmanthus is an apricot-like note that seems to convey both a velvety skin and a juicy pulp, and in the fragrance's opening stages, it's lush and vibrant. As it mellows, it's met by the creaminess of jasmine and lily petals. The dry down of Nuit de Cellophane, however, with its pale musk and sheer woods, feels somewhat thin. I'd forgive the fading of that delicious osmanthus note if a similarly sensuous note or accord emerged in the fragrance's base, but unless I'm missing something, there's no compensation. Despite its name, Nuit de Cellophane never really evokes night-time. It seems to dim, but not darken. Nuit de Cellophane has average staying power; as an Eau de Parfum, it should probably last longer, but at least it's more durable (and smoother) than other peachy white-florals like Angels of Florence by Santa Maria Novella or i Profumi di Firenze Florentia 22 (Pesca e Fiori). Robin recently wrote that the squeaky-clean L'Eau Serge Lutens seems designed to be a top-seller for the brand and, more specifically, to capture the attention of the lucrative Asian market. The same could be said for Nuit de Cellophane. It's a very versatile, very wearable, high-quality take on the fruity-floral genre; it just didn't move me, emotionally. And, even though I can't carry off the weirdness of many Lutens fragrances, I still expected Nuit de Cellophane to have some kind of subtle twist that would mark it as part of the line. If there is such a twist, I couldn't detect it. Overall, I felt as though I'd walked into a Surrealism exhibition and found myself facing a wall of paintings by Renoir instead: lovely stuff, just not quite what I was expecting. I know, now I'm being difficult! However, if I were to invest in a high-end osmanthus fragrance, I'd probably opt for Ormonde Jayne's Osmanthus, which remains brightly elegant, keeping my interest throughout. Serge Lutens Nuit de Cellophane was created by perfumer Christopher Sheldrake; it is available in 50 ml Eau de Parfum. For buying information, see the listing for Serge Lutens under Perfume Houses. Note: image is Sweet Osmanthus [cropped] by yurayura_naoko at Flickr; some rights reserved. I like a lot of things from Serge Lutens, but I hate Nuit de Cellophane. I had high hopes for it when it came out, but it was harsh, cheap soap on me, and the longer I wore it, the worse it got. I do, however, like OJ Osmanthus quite a bit. Occhineri, I can’t say that I hated it (and there are several Serge fragrances towards which I really *do* feel, um, a strong distaste…), but I somehow expected it to have a little more quirk or edge to its personality. I feel the same way about Lutens’ scents, J. I always enjoy smelling them (often in the same way I like smelling brewer’s yeast: with equal parts revulsion and delight), but I almost never want to wear them. And there’s something about Nuit de Cellophane that, as you say, just doesn’t fit. It’s like a peachy silk dress that, while completely beautiful, is an inch too narrow in the shoulders and slightly too big in the bust. You wear it, and want to love it, but you can’t help but feel a little awkward and itchy, and long for the moment when you can sneak home to put on soft, ratty jeans and a spray of Theorema. Thanks for the fab review, as always! Chanterais, That’s the perfect analogy! It really is pretty, and I’m hope it will find some devoted fans. If someone who already likes apricot-y, peach, white florals wants to splurge on a niche fragrance, this is a perfect fit. Late to post as usual. Anyway, 100% agree to the use of this analogy. I had high expectations when this was released, smelled it, and just can’t decide whether to buy it or not. Something is just… missing or lacking or wrong. Since I am a fan of SL (Douce Amere being one of my favorites), I just can’t (or will not) leave his counter without a purchase. And that is the back story of how I got my Daim Blond. P.S. I like the way you review fragrances, Jessica. Thank you and I hope to read more reviews from you. Thank you, Pinoiperfumista! Glad you enjoyed it. This one did nothing for me either which is a shame since osmanthus is one of my favourite notes. And Jessica, I’m glad I’m not the only one not in love with the SL line in general. I can appreciate almost every single scent theoretically but I don’t love them – also, most are too sweet for me. Well, as to this one, I will stick with my beloved Osmanthe Yunnan (have to try the OJ – now, that”s a line I deeply care for!). Kristina, Osmanthe Yunnan is lovely, like most of Hermessences! I’ve also tried and loved The Different Company’s Osmanthus, but it had such brief staying power on my skin that I couldn’t justify buying it. I didn’t like any SL scents for the longest time. I was intrigued by Chene (still am). Then someone stuck Arabie under my nose and I have to have some. I also have a bottle of the Fleurs d’Oranger. I appreciate them much more, and can wear some. This one I have only smelled on paper, and it made little to no impact. Tama, I do like Fleurs d’Oranger, and Un Lys… but I haven’t really felt the *need* to own a bottle of either one. Strange, right? And I admire Bois de Violette and Ambre Sultan and some others, but they’re not the type of fragrance that I typically wear. There is a small handful of Lutens scents that leave me indifferent, but they are few: mostly, I either love them desperately (too many to name — I own ten) or loathe them utterly (Louve — kill me if I ever have to smell it again). Nuits de Cellophane is one of the rare “meh” scents in his line; I just can’t bring myself to care. And I like osmanthus, too; but NdC leaves me cold. Oh… Louve. I thought I’d love that one, but it felt very blunt to me. On the other hand, Rahat Loukhoum is the one full-sized SL that I own. (I asked a friend to purchase it for me. I have to be in a certain mood to enjoy it, but when it’s right, it’s right. Rahat Loukoum is awfully good, isn’t it? Much too sweet for me to actually wear (I love sweet scents but RL just seems to amplify on my skin), though I love the smell of it. I also really like OJ’s Osmanthus. In fact, of her handful of scents, I adore Ta’if, Woman, Champaca. SL, on the other hand, has so many more perfumes and yet I only adore Chergui (although I also own JdPeau and MKK – don’t know why I did that one, though). I second Kristina – OJ is a line a deeply care for! Chergui! That one has a strong following. I must have tried it at some point… but can’t remember what I thought. Need to revisit it! I was in Paris a couple of weeks ago and picked up a bell jar of La Myrrhe. AMAZING stuff! Hi, Raymond! Well, that’s one I haven’t smelled, for obvious (non-export) reasons. I tend not to wear incense-y fragrances… but I’m sure this is a good one! Nuit de Cellophane –I have this in my collection….no it’s not terribly complex and it isn’t very Serge Lutens-y…..but sometimes non challenging is nice. Is that already a hip hop lyric or a tee-shirt slogan? If not, you’ve really got to sell it! “No” to “Ho” made me have to get some screen cleaner as I was eating a snack when I burst out laughing – thank you! Its odd, I do like SL and I like Nuits De Cello as well, and its my only full bottle from the line for some reason. Just strange that my one somewhat fruity floral type is a Serge Lutens. Makes no sense. You’d think my one Incense or Musky Arabian Sweat accord fragrance would be SL, but no, its my fruity floral. Its like having my one Leather be from Brittany Spears. Hah! Exactly. But it *is* a high-quality fruity floral, even if it’s not a typical SL offering! Jessica, thanks for the review. I think I agree in large part – NdC was really *pretty* until it got to the drydown, where it just petered out into nuthin’ and left me wanting something nice. A peachy musk, a sandalwood that was actually there? SOMEthing, please, Uncle Serge. Mind you, I like a nice fruity floral, if it’s not too sweet or too brainless (there are far too many of those); this one is just a little too… absent… for me. And the only SL that I really love so far is La Myrrhe. I like El Attarine, and some day I’ll get my hands on some Daim Blond, but for now – just La Myrrhe. Mals86, I’m glad I’m not alone in my reaction! And, oh… Sarrasins! I forgot about that one. I own a decant, thanks to a very kind friend, and I think it’s a beauty. Again, I have to be in a certain (jasmine-wearing) mood, but it’s stunning. I really don’t think you have to worry about your perfumista license being revoked, Jessica. I think you were thoughtful and respectful knowing this line has a lot of respect and love here, but you were honest and gracious. And that’s wonderful! Very thoughtful and well done review, thank you. Thank you, Fuddy Duddy. Much appreciated! SL has scents I like, such as Rousse and Bois de violette, but it’s heavy on the overall. Talking about not being fan of a famous house with many followers, I really need to say that Frederic Malle is the biggest mistery for me. I had headaches for every fragrance I tried from this house. I consider them all linear, bold, too strong, too in the face, not interesting, tiring. Why so many FM lovers? I agree on the FMs – I just don’t understand (yet?) What all the fuss is about. I’m kidding, of course. But at least these houses all have strong personalities! I love Lutens, but my sample NdC smelled mass-market floral, not niche floral. Nothing special, just pleasant. It *is* very pleasant, and to my nose, much better than most things I’d smell on the fragrance wall of Sephora… but I own enough “pleasant” perfumes right now, so I won’t be acquiring a full bottle of this one!